George Caleb Bingham was one of the most important American painters of genre subjects in the mid-19th century. His series of scenes of life and work on the Missouri and Mississippi Rivers established his reputation in his own day and are today recognized as his finest creations. The Jolly Flatboatmen, along with Fur Traders Descending the Missouri (1845, Metropolitan Museum of Art), are the masterpieces of Bingham’s river pictures and icons of American art. In 1847, the American Art-Union, which had purchased The Jolly Flatboatmen directly from the artist, produced a large mezzotint of it that was distributed to its members (approximately 10,000) throughout the country, immediately making it one of the best-known works of art of its era. It depicts a group of men who, after accomplishing the hard work of rowing their flatboat upstream and loading it with cargo, are now relaxing and enjoying music and dancing. Bingham’s careful attention to detail is everywhere evident—a raccoon pelt hanging from a nail; a coil of rope; a turkey, which sticks its head out between the slats of the crate below the dancing man; a blue shirt hanging to dry. The composition is at once dynamic—the dancing man and the musicians—and elegantly stable in the way Bingham arranged the figures to form an isosceles triangle. The painting survives in superb condition, with its subtle brushwork, soft colors, and precise drawing intact. The Jolly Flatboatmen joins two paintings by Bingham already in the Gallery’s collection—a fine early landscape, Cottage Scenery (1845) and Mississippi Boatman (1850). The Gallery’s recent acquisition of works from the Corcoran collection significantly strengthened its representation of American genre painting. Superb works were added by Bingham’s contemporaries William Sidney Mount (The Tough Story–Scene in a Country Tavern, 1837), William Tylee Ranney (The Retrieve, 1850), and Richard Caton Woodville (Waiting for the Stage, 1851). The Jolly Flatboatmen now becomes the cornerstone of that group and one of the most significant paintings in the Gallery’s collection of 19th-century American paintings. Submitted by the artist for sale to the American Art-Union, New York; recommended for purchase 9 October 1846 by the Union's executive committee, as Dance on the Flat boat; reported as chosen to be engraved as a mezzotint 2 November 1846 by the Union's committee on the engraving for 1847; officially renamed The Jolly Flatboatman [sic] 6 December 1846 by the Union's executive committee; turned over to the engraver 7 December 1846; payment for purchase approved 1 February 1847; awarded at its annual meeting 24 December 1847 by the Art-Union to Benjamin van Schaick. Herbert Claiborne Pell, Jr. [1884-1961], New York; his son, Claiborne Pell [1918-2009], Washington, D.C., and Newport, Rhode Island; Pell Family Trust; purchased 1986 by Richard A. Manoogian, Detroit; Richard and Jane Manoogian Foundation,Taylor, Michigan; purchased 8 April 2015 by NGA. The details of the painting's early history and the widely-distributed engraving made of it are traced by John Francis McDermott, "Jolly Flatboatmen: Bingham and His Imitators," Antiques 73, no. 3 (March 1958): 266-269. Benjamin van Schaick was a grocer who lived at 76 Warren Street in New York City. His receipt of the painting was announced in Transactions of the American Art-Union for the Year 1847, New York, 1848: 32, no. 1. McDermott speculates that the engraver finished with the painting in the spring of 1848, after which it was delivered to its new owner. The painting's location after 1847 was not publicly known until 1952, when the art historian Fern Rusk Shapley was invited by Claiborne Pell to see it in his Washington house. In 1954 Pell lent the painting to an exhibition at the City Art Museum of St. Louis, and Shapley published her article "Bingham's 'Jolly Flatboatmen'," Art Quarterly XVII, no. 4 (Winter 1954): 352-356. The article quotes a letter of 25 August 1954 from Claiborne Pell's father, Herbert C. Pell, Jr., to Shapley (356 n. 8), in which the elder Pell writes that his "great-grandfather William Pell" purchased the painting "direct from some exposition," that it was inherited by his grandfather Clarence Pell and hung in his grandmother's house at 119 East 36th Street in New York, and had been "in the family possession more than sixty years ago," which would have been in the late 19th century. However, Herbert C. Pell, Jr.'s great-grandfather, William Ferris Pell, died in 1840, six years before the painting was created, and so could not have been the original Pell family owner. Herbert Jr.'s grandfather, Clarence Pell, lived from 1820 to 1865, and was possibly the Pell who purchased the painting, or it could have been another William in the large Pell family who acquired it. Further research may discover the details. American Art-Union, New York, 1847, no. 1. Westward the Way. The character and development of the Louisiana Territory as seen by artists and writers of the nineteenth century, City Art Museum of St. Louis; Walker Art Center, Minneapolis, 1954-1955, no. 150. American Classics of the Nineteenth Century, Carnegie Institute, Pittsburgh; Munson-Williams-Proctor Institute, Utica; Virginia Museum of Fine Arts, Richmond; Baltimore Museum of Art; Currier Gallery of Art, Manchester, New Hampshire, 1957-1958, no. 23 (shown only in Pittsburgh). George Caleb Bingham 1811-1879, National Collection of Fine Arts, Washington, D.C.; Cleveland Museum of Art; The Art Galleries, University of California at Los Angeles, 1967-1968, no. 13, fig. 6. (shown only in Washington, D.C.). The American West: Painters from Catlin to Russell, Los Angeles County Museum of Art; M.H. de Young Memorial Museum, San Francisco; St. Louis Art Museum, 1972, no. 36, pl. 50. American Light: The Luminist Movement, 1850-1875, National Gallery of Art, Washington, D.C., 1980, unnumbered catalogue, fig. 43. La Pintura de Los Estados Unidos de Museos de la Ciudad de Washington, Museo del Palacio de Bellas Artes, Mexico City, 1980-1981, no. 10, color repro. Rhode Island Collects, Museum of Art, Rhode Island School of Design, Providence, 1981. Bilder aus der Neuen Welt: Amerikanische Malerei des 18. und 19. Jahrhunderts, Nationalgalerie, Orangeries des Schlosses Charlottenburg; Kunsthaus Zurich, 1988-1989, no. 37, repro. American Paintings from the Manoogian Collection, National Gallery of Art, Washington, D.C.; Fine Arts Museums of San Francisco; The Metropolitan Museum of Art, New York; Detroit Institute of Arts, 1989-1990, no. 23, repro. George Caleb Bingham, Saint Louis Art Museum; National Gallery of Art, Washington, D.C., 1990, unnumbered catalogue, pls. 5 (detail), 37, 46 (detail); (shown in Saint Louis only for the first three weeks of the venue, then re-joined the 1989-1990 exhibition of the Manoogian collection). American Stories: Paintings of Everyday Life 1765-1915, The Metropolitan Museum of Art, New York; Los Angeles County Museum of Art, 2009-2010, unnumbered catalogue, fig. 49. Duyckinck, Evret A., ed. “The Fine Arts: The Art Union Pictures." The Literary World: A Gazette for Authors, Readers, and Publishers 2, no. 38 (October 23, 1847): 265, 277. Transactions of the American Art-Union, 1847. New York, 1848: 32, no. 1. Ruckstuhl, F. Wellington, ed. “George Caleb Bingham: An Early Painter of Missouri.” The Art World 3, no. 2 (November 1917): 94, 98, repro. Shapley, Fern Helen Rusk. George Caleb Bingham: The Missouri Artist. Jefferson City, 1917: 33-37, 42, 121, plate XIX. Spencer, Thomas Edwin. A Missourian Worth Remembering: George Caleb Bingham. St. Louis, 1930: 23-24. Shapley, Fern Rusk. "Bingham's 'Jolly Flatboatmen'." The Art Quarterly. 17, no. 4 (Winter 1954): 352-356, repro. McDermott, John Francis. "Jolly Flatboatmen: Bingham and His Imitators." Antiques 73, no. 3 (March 1958): 266-267, repro. McDermott, John Francis. George Caleb Bingham, River Portraitist. Norman, Oklahoma, 1959: xxi, xxvii, 3, 49, 55-57, 58, 59, 181, 184, 189, 218, 414 (no. 31), pl. 22. Miller, Lillian B. Patrons and Patriotism: The Encouragement of the Fine Arts in the United States, 1700-1860. Chicago, 1966: 222. Bloch, E. Maruice. George Caleb Bingham: A Catalogue Raisonné. Berkeley, 1967: 56 (no. 146[a]), 233. Bloch, E. Maruice. George Caleb Bingham: The Evolution of the Artist. Berkeley, 1967: xix, 84, 85, 87-92, 95, 98, 102, 103, 109, 136, 153, 234, 256, 302, 335, color plate 53. Christ-Janer, Albert. George Caleb Bingham: Frontier Painter of Missouri. New York, 1975: 66, , 170, color plate 20. Eager, Gerald. "The Iconography of the Boat in 19th-Century American Painting." Art Journal 35, no. 3 (Spring 1976): 227, fig. 6. Andrus, Lisa Fellows. "Measure and Design in American Painting, 1760-1860." Ph.D. dissertation, Columbia University, 1976: 57-59. Bloch, E. Maurice. The Paintings of George Caleb Bingham: A Catalogue Raisonné. Columbia, Missouri, 1986: xxi, 13, 175 (no. 175), 272, color plate 175. Michael Allen. Western Rivermen, 1763-1861: Ohio and Mississippi Boatmen and the Myth of the Alligator Horse. Baton Rouge, 1990: 17 nt. 23, 18, 25, 121, 215, 216, repro. Johns, Elizabeth. American Genre Painting: The Politics of Everyday Life. New Haven, 1991: 84-87, 137, 198, 226 (note 43), color plate 9. Rash, Nancy. The Painting and Politics of George Caleb Bingham. New Haven, 1991: 67, 72-75, 82-86, 91, fig. 25. Holz, Keith. "Bringham, George Caleb." In Allgemeines Künstler-Lexikon, ed. Günther Meissner. Munich/Leipzig, 1995: 11:99, 100. Johns, Elizabeth. "Bingham, George Caleb." In The Dictionary of Art, ed. Jane Turner. 34 vols. New York and London, 1996: 4:72, repro. Gale, Robert. "Bingham, George Caleb." In American National Biography, ed. John A. Garraty and Mark C. Carnes. 24 vols. Oxford, 1999: 2:788. Wilmerding, John. Compass and Clock: Defining Moments in American Culture. New York, 1999: 118, 119, fig. 40. Nagel, Paul C. George Caleb Bingham, Missouri’s Famed Painter and Forgotten Politician. Columbia and London, 2005: 53-54. Miller, Angela et al. American Encounters: Art, History, and Cultural Identity. Upper Saddle River, NJ, 2008: 226, 227, color fig. 7.17. Johns, Elizabeth. "Bingham, George Caleb." In The Grove Encyclopedia of American Art. 5 vols. Oxford, 2011: 1:271. Conrads, Margaret C. "George Caleb Bingham and the River." Review of Navigating the West: George Caleb Bingham and the River. Exh. Amon Carter Museum, 2014-2015. American Art Review 26, no. 5 (September-October 2014): 65, color repro. "Art for the Nation: The Story of the Patrons' Permanent Fund." National Gallery of Art Bulletin, no. 53 (Fall 2015): 5, repro. Berry, Wendell and Sanford Schwartz. "Letters: Life on the Mississippi." New York Review of Books 62, no. 14: 93, color fig. Gardner, James. "One Off: 'There has never been another artist like George Caleb Bingham'." Review of "Navigating the West." Exh. Metropolitan Museum of Art, 2015. The Magazine Antiques 182, no. 4 (July/August 2015): 112, 113, 116-117, color fig. 1, 3. Kennedy, Randy. "Inside Art: National Gallery Buys 'The Jolly Flatboatmen'." New York Times 164, no. 56,881 (May 29, 2015): C20, color repro. McCaughey, Patrick. "Down the River of Time." Review of Navigating the West. Exh. New York 2015 and exh. cat. Times Literary Supplement 5,863 (August 14, 2015): 18, color repro. Schwartz, Sanford. "The Lure of Life on the Missouri." Reviews of "Navigating the West: George Caleb Bingham and the River," exhibition and exh. cat. New York 2015. New York Review of Books 62, no. 11 (July 25, 2015): 51. Smith, Roberta. “The Frontier Life, Timeless and Still.” New York Times 164, no. 56,902 (June 19, 2015): C22, color repro. Corbett, David Peters. 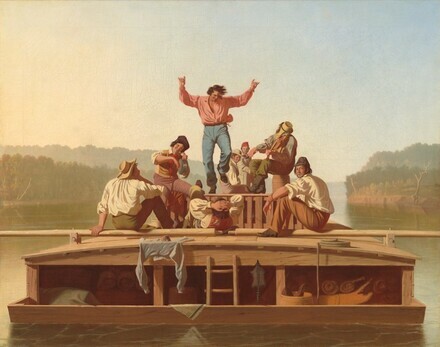 "Facingness in George Caleb Bingham's River Paintings." American Art 32, no. 2 (Summer 2018): 2, 7, 8-9, 10,11, 12, 14, 17, 19, 21, 22 note 13, color fig. 4.